Fundraisers said that that they had been let down by Console. A NUMBER OF people have spoken out against suicide awareness charity Console after details of financial irregularities emerged yesterday. In light of work done by an RTÉ Investigates programme last night which delved into the finances of Console over the past number of years, founder and CEO Paul Kelly resigned. The programme claimed that Kelly has a “history when it comes to misrepresentation and deception”. The programme shows that, when applying for state grants and tax exemptions, the charity altered accounts to omit or edit references to directors’ pay and other benefits. RTÉ also reports that the charity’s directors, from 2010 to early 2014, were made up of founder Kelly, his wife Patricia, a close family relative and, briefly, another immediate relative. Speaking today on RTÉ’s Liveline programme, a woman whose son had died by suicide and who had worked hard to raise funds for Console expressed her anger in the charity. “I actually feel physically sick,” said the woman. We feel totally let down. We were in shock yesterday… and obviously we’re all deeply upset over it. The woman commended the counselling staff at Console, saying that they were “absolutely fantastic”. “They’re absolutely fantastic staff and they’re dedicated to what they do,” she said. This is not down the counsellors in the centre and they heard about this in the same way that we heard about this. Bríd said that through fundraisers she and her family had conducted for Console they had raised somewhere in the region of €60,000 for the charity. “That’s not including the advertising that we have done for Console around the country,” she said. Bríd said that she had met Paul Kelly “eight or 10 times” and that she had “never seen anything wrong” with him. 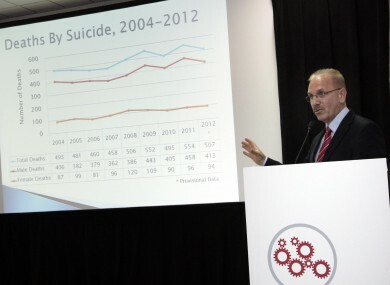 Another man – Robert Davy – who said that he had lost a son to suicide, also spoke on the programme about meeting Kelly. Davy said he had raised money for the charity in the past and echoed Bríd’s statements about the “fantastic” counselling service offered. “They’re counselling service is fantastic… it’s just fantastic,” he said. Following yesterday’s revelations about Console, the board has appointed external reviewers to conduct an investigation into alleged financial irregularities at the charity. The two reviewers are a forensic accountant Tom Murray, and David Hall, CEO of the Irish Mortgage Holders Organisation. Email “"I actually feel physically sick" - Console service users hit out at charity management”. Feedback on “"I actually feel physically sick" - Console service users hit out at charity management”.